It takes the arrival of Tumbling River’s new doctor — and her concern for the well-being of the colony’s children, no matter which species — to show Amanda the significance of her personal impact on the planet. 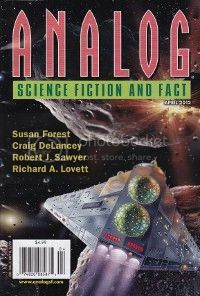 “The Most Invasive Species” was first published in Analog Science Fiction and Fact — April 2012 — Vol. CXXXII No.4. Nice story about humans meddling with ecosystems (and species) they don’t really understand, and messing up. The short fiction begins with “The Most Invasive Species” by Susan Forest. Humans have settled a world with a native intelligent species. They have got along fine with the natives, even though they have different customs. When, Karen, a new doctor comes with her family to the planet, she becomes appalled at the way the natives treat their children. The children are regularly bitten and beaten. An incident changes things, but not for the better. “The Most Invasive Species” is available on Smashwords and Amazon.